The American River College men’s tennis team earned its sixth victory in a row after Tuesday’s 9-0 win over Chabot Community College, which will advance them to the regional Northern California State Championship to play Foothill Community College on April 18. ARC will play to try to win its fourth straight conference championship. In doubles matches, freshmen Nic Atkinson and John Foote won their number two doubles match 7-2. In the final singles match, freshman Dylan King won a 7-3 set match tie breaker to complete the sweep of Chabot during the final singles game. “It’s business as usual like any given day,” said King on his mindset going into his first State Championship. Fellow players Ryan Wilson and T.J. Auckland won their doubles matches 8-2, and Jimmy Giovannini and Seppi Capaul won their doubles matches 8-5. The wins put ARC up 3-0 over Chabot after doubles matches. “Doubles is something we worked hard. Singles is a different game,” said Jabrey-Madison. 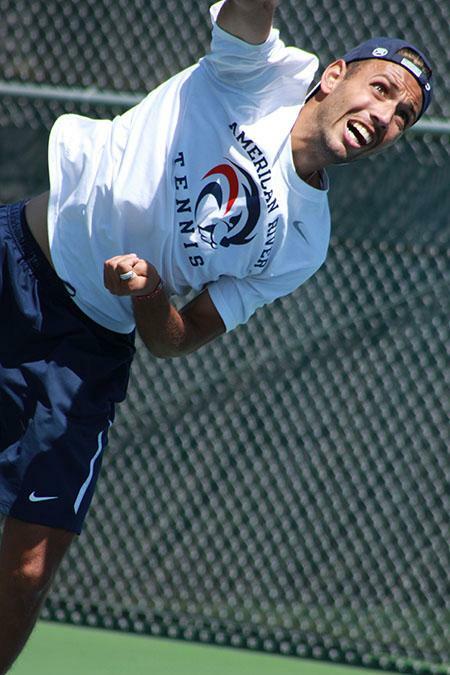 ARC’s Seppi Capaul went 6-1 during his singles match and won 8-5 in his doubles match with teammate Jimmy Giovanni. Be the first to comment on "ARC’s mens tennis moves on to regional State Championship"